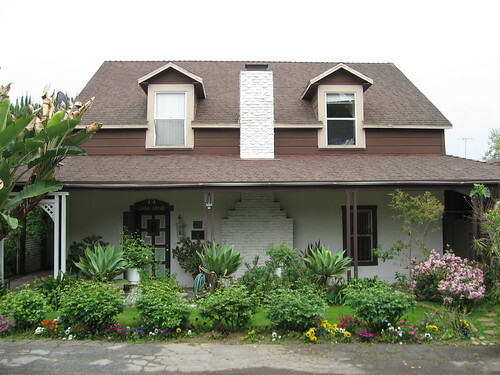 Antonio Jose Rocha II built this adobe and wood home in 1865, seven years before he was officially deeded his 100-acre parcel of land, part of “the corner of the oxen ranch”, Rancho Rincon de los Bueyes (which itself was made up of more than 3,100 acres). The larger tract of grazing land was owned by brothers Francisco and Secundino Higuera, whose father, Bernardo, was one of the original co-grantees of the Rancho back in 1821. Rocha II was well off – his dad was once a grantee of Rancho La Brea. 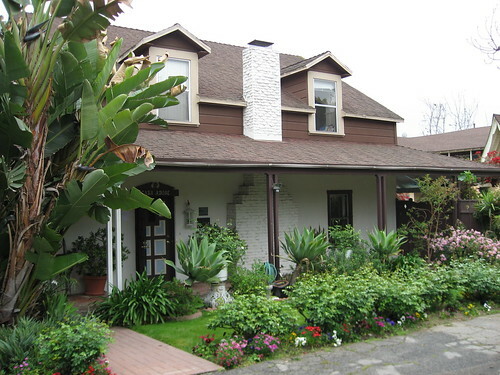 (In fact, that Rancho’s older Gilmore Adobe, HCM No. 543a, now surrounded by the Farmers Market, HCM No. 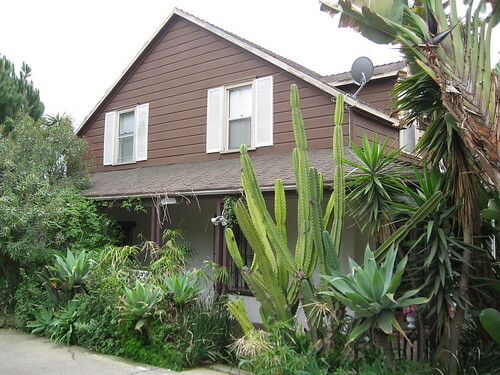 543b, is sometimes referred to as the Rocha Adobe. Don’t be fooled.) Rocha II himself served as Los Angeles county assessor and a Justice of the Peace. You need to walk back a lane a bit to get a glimpse of HCM No. 13, and it’ll be little more that – a glimpse. Rocha House is a private home and is pretty well covered up with fences and foliage. I don’t know who lives there now, but I do know the house stood empty for a while until a Rocha descendant bought it. It was restored in 1979. There are roofed porches (Sp. corredores) circling the whole building, keeping the place cooler (but not giving much sunlight to the first floor, I reckon). That’s redwood siding on the second story. I got a lot of this information from the John R. Kielbasa’s book, Historic Adobes of Los Angeles County via the L.A. Okay website. Once again, most excellent blogging...uh, Floyd? It really is a delight to read. Amy and I rolled on over to Carroll Ave. this morning a just loved it. Small suggestion: you might want to make this thing more search engine friendly. Not having the link itself at home, I gave it ol' college try (read drunk with a 'shroom hangover) and couldn't for the life of me find the durn thing. Wow this site is fun. Iloved it and learned cool stuff. Thanks, George. See you soon. Jose Antonio Rocha was my great, great, great, great grandfather! This was my great grandfather.